VANCOUVER, BRITISH COLUMBIA--(Marketwired - June 24, 2015) - Nevada Copper Corp. (TSX:NCU) ("Nevada Copper" or the "Company") is pleased to announce additional results of diamond drilling on the North and South open pit deposits and provide a project update at the Company's 100% owned Pumpkin Hollow project located near Yerington Nevada. Drilling continues to expand the open extent of mineralization in the North and South open pit deposits including areas that may have economic copper mineralization but are currently categorized as inferred, or waste, due to limited drill data. Phase 1 of the drill program, which started in late February, has been completed. Currently 21 holes have been completed for a total of 34,600 feet (10,600 meters). The results for 10 holes have previously been released. This news release provides the results for five drill holes bringing the total holes released to 15. The results for the remaining 6 holes are pending. The holes were drilled in the North and South deposits and the Connector zone between the deposits. Drill holes NC15-08 and NC15-10 were drilled in the Connector zone. NC15-11 was drilled in the center of the North deposit where mineralization was expanded and copper grades were higher than the adjacent holes. Drill hole NC15-15 expanded mineralization within the current pits limits on the north edge of the North deposit and NC15-12, drilled in the South deposit, expanded mineralization to the north toward the Connector zone. Drill holes NC15-08 and NC15-10 are located in the Connector zone between the North and South open pit deposits. Both holes intersected narrow zones of mineralization. Drill hole NC15-11, located in the center of the North deposit, intersected multiple zones of mineralization in the center of the deposit. The largest zone, 116.3 meters (381.5 feet) true thickness averaging 0.53% copper is higher grade and thicker than adjacent holes. The new lower zones below this intercept fill in areas where drill density was limited and the material was previously classified as waste or inferred. Additional drilling is currently under review. 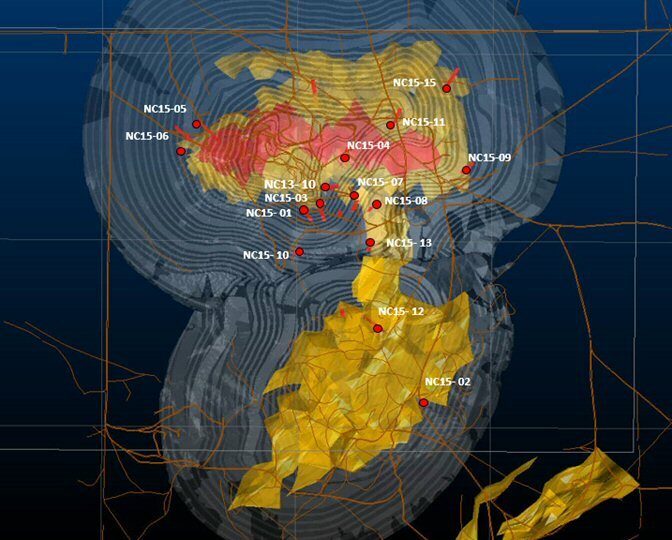 Drill hole NC15-12 which is located on the northern edge, and within the designed South pit limit, intersected multiple zones of mineralization. The highest grade was 50.6 meters (166.0 feet @ 0.75% Cu), 38.8 meters true thickness. The mineralization is continuous with adjacent holes and remains open. Additional off set holes are planned. Drill hole NC15-15 is located along the northern edge and within the designed North pit limit. The mineralization is continuous with adjacent holes and is open to the north. Greg French, Vice President of Project Development & Exploration, commented, "We continue to be very pleased with our drilling results to date within the design limits of the Western open pit deposits. Mineralization is expanding into areas currently classified as waste or inferred material. With the current breakeven cut-off for the open pits at 0.16% copper, the addition of this mineralization should have a positive effect on mine design and strip ratios. Drill hole NC15-11 has intersected mineralization projected below previous shallow drilling, as was the case for the previously-released drill hole NC15-04. These lower zones will expand mineralization in the center of the North deposit. The thickest intercept, 381 feet averaging 0.53% copper not only expanded mineralization, but is higher grade than adjacent holes." The table below summarizes the results received. Assays for the remaining drill holes will be posted as results are received. The underground drilling program began during the last week in May. This program will consist of up to 26,000 feet (7,900 meters) of delineation and development drilling which will focus on further enhancing the high grade zones within the current mineral reserve, especially in areas planned for mining in the early years. Drilling in the South pit area for the bulk sample for iron metallurgical test work has been completed and assays are pending. On April 23, 2015, the Company announced a Memorandum of Understanding ("MOU") with a large multi-national steel producer to assess opportunities to exploit the large Pumpkin Hollow iron resource. The assessments would include drill sampling consisting of six holes for a total of 8,500 feet (2,600 meters). Drill results from this drilling will be released as they become available and the results will report both iron and copper assays. Additionally mine planning, engineering studies and metallurgical work will also be completed. These studies will determine if a byproduct magnetite (iron oxide) stream from the copper tailings at a future Pumpkin Hollow concentrator would be suitable as feed for downstream iron ore processing for use in steelmaking. The Federal land acquisition administrative process is progressing as planned, with land surveying and official land records maps completed, and official deeds and land valuation appraisal 90% complete. State permitting activities for the Integrated project are continuing and are now in the final phase, with issuance of all key construction and operating permits expected by August. Subject to project financing, commencement of project construction would then be able to proceed on closing of the land acquisition from the Bureau of Land Management.